(Yachats, Oregon) â€“ At Neptune State Scenic Viewpoint, in the dramatic stretch of beaches and cliffs between Yachats and Florence, there’s a simple cave in the cliffs. 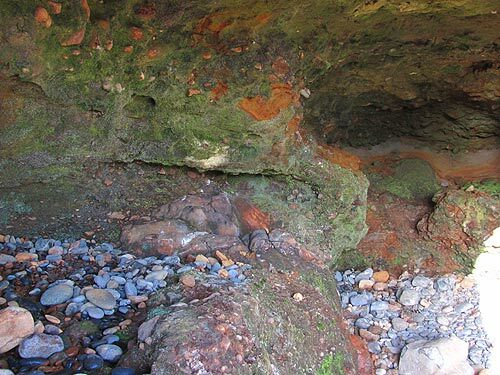 As far as caves go, it’s just a tad more interesting than many on the Oregon coast because of the odd colors within, and the fact it’s actually big enough for you to walk inside. 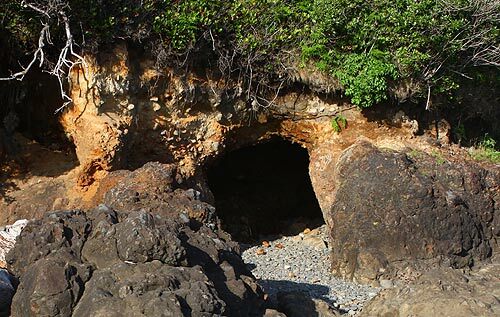 The cave tells a larger, stranger tale, however, as do the chunks of rock surrounding it. It's an ancient story of towering volcanoes and some underwater eruptions, searing lava flows, continents drifting over millions of years, and of little creatures doing remarkably large-scale damage. The rock the cave is made up of is a bit puzzling, certainly in color. It gives the impression of some sort of sandstone, but it’s likely a form of basalt with other things mixed in â€“ a breccia or a conglomerate, depending on a number of factors. A sandstone cave would not last very long, but documentation about this one goes back decades. The reddish color could come from either a lot of iron in the mix or from whatever else comprises this mix of basalt and other rocks. 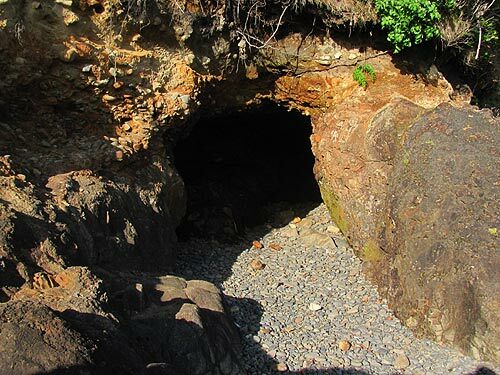 Seaside resident and geologist Tom Horning thinks this basalt could include sandstone or a mix of mostly sediments and sandstone â€“ he wasn’t there personally and only saw photos provided to him by Oregon Coast Beach Connection. Lots of things could cause a mixed rock structure like a conglomerate or breccia to turn reddish in color. Cape Perpetua was a local volcano back then, like Lincoln City's Cascade Head - a "true blue coastal volcano" as Horning put it. Consequently, the rocky formations in and around Yachats and Neptune State Scenic Viewpoint are quite varied. Some of the tide pool spots here are black and others get a bit more reddish, depending on how they were created. Then you can literally look back in time some 80,000 years by looking at the mostly-sandstone cliffs that rise above the beach: each layer tells a different geologic tale over these millennia. Parts of those layers were actually seabeds at one time. 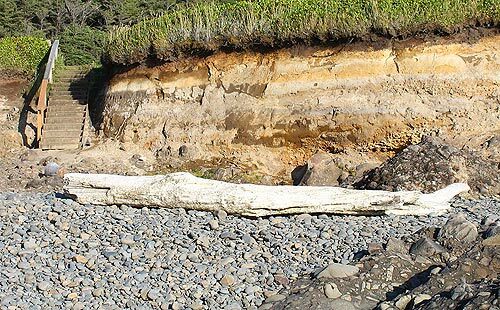 The bulk of the black rock you see around Yachats is Eocene era â€“ about 50 million years old. Then another curious aspect arises in this area, if you look close. The basalt rock surrounding the cave â€“ which Horning said is the bedrock of the area â€“ has hundreds of little pits. What on Earth (or beneath it) could cause such a hard surface as basalt to get little holes in it? 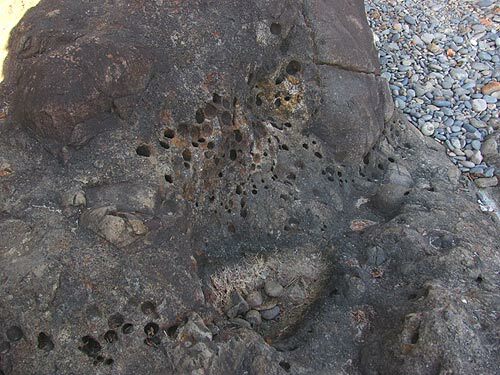 “The holes have been drilled by rock-boring clams in the softer matrix,” Horning said. It’s a bit like some alien movie: some creature has burrowed its way into the rock and thousands of them are living there.